Tilt / Swing (360° field of vision, version 1), 2009. Exhibition: Liz Deschenes, ICA Boston (June 29 - October 16, 2016). Photos courtesy the artist and Miguel Abreau Gallery, New York. Liz Deschenes is an artist who lives and works in New York. Deschenes’ work has been noted for its exploration of representation and abstraction in photography, especially as it relates to the permanence and impermanence of experience and process. CA had an opportunity recently to discuss the work with the artist. 1. Cincala Art: Your work is often referred to as non-representational photography, but to my mind it is quite clearly not reductionist or pure in the sense of what we often think of as minimalist. Can you speak to this categorization of non-representational photography with respect to your work, and specifically how you seek to reveal, conceal or otherwise address the possibilities within the medium of photography? How do you see your work placed within the broader arc of art history? 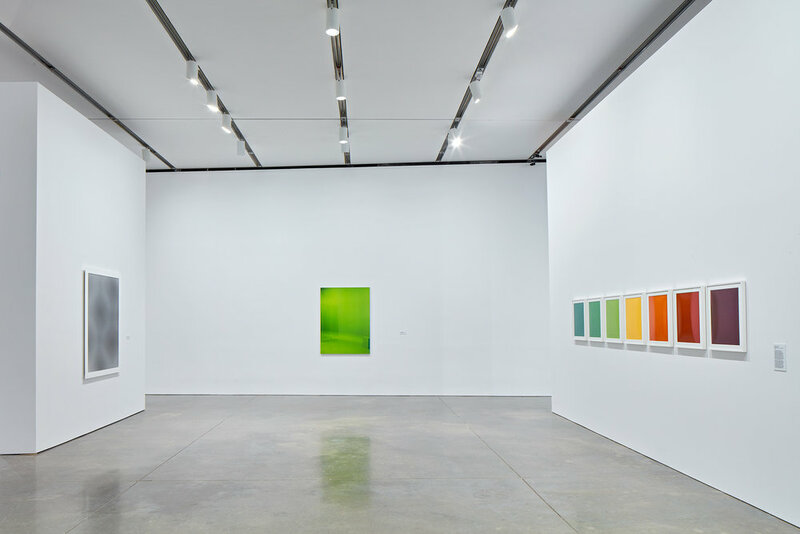 Liz Deschenes: If it’s non-representational it’s also at times representational—from some of the green screens and black and white screens, to the Moires to the silver photograms—there is recognizable content. Sometimes the content is a material condition and, sometimes, it’s more direct—an image of a screen is photographed and printed to reveal the pixels, the warp, the weave. A fellow artist recently said the work was structuralist—I think the work hovers around these distinct areas of categorization. Suffice it to say, I don’t want the work to be so easy to classify. It’s not minimalism, conceptualism or abstraction. But, at times, it borrows from and nods to them all. Moiré, 2007; Green Screen #5 ed. 1/5, 2001; Elevation #1 - #7, 1997. Exhibition: Liz Deschenes, ICA Boston (June 29 - October 16, 2016). Photos courtesy the artist and Miguel Abreau Gallery, New York. Gallery 7, 2014. Exhibition: Liz Deschenes, ICA Boston (June 29 - October 16, 2016). Photos courtesy the artist and Miguel Abreau Gallery, New York. 2. CA: I love the element of surprise and chance that permeates your work, and I think I am particularly drawn to your photograms at least partially for this reason. As photographs made without the use of a camera, I suppose the first implication here is that capturing images, at least in the traditional representational sense of photography, is not the goal. But when reading about your process I was struck by the importance of the variables that are welcomed, and quite literally absorbed, into the work. Things like temperature, humidity levels, and the ambient light from natural sources as well as the built environments all come into play and leave their unique, non-repeatable marks. But this is not something you explicitly seek to control or stage, like, say, in a traditional photographic portrait. Can you speak more to this idea of chance vs intention, and how your process relies on both? LD: They are always in conversation—intent and chance. I think that there’s probably a lot more control in the procedures than I may have articulated in previous interviews. I’m very experienced and comfortable with Photographic papers and chemicals; I’d say that the 30 plus years of making photographic prints allows me to play with chance in ways that are probably less about “experiment,” and more about knowing to a certain degree what variables will manifest in compelling and new-found results. I respond to what’s happening on the surface of the works, and adjust accordingly. That said, there are some situations that are extreme—like high heat and humidity—these can be difficult to replicate, so I don’t try to duplicate previous sessions. Instead I find new sets of variables that can result in all unfamiliar marks, surfaces and tones. 3. CA: In an interview with Jonas Storsve in 1991, the musician John Cage, when speaking about his collaborations with the dance choreographer, Merce Cunningham, related the pair’s working style as less associated with an “object” that has clear boundaries from the onset, but rather a “style” akin to unpredictable weather patterns, where difficulty arises in precisely pinpointing when one thing (the music) starts and another (the dance) ends. Accordingly, the two artists never began a project with a pure idea but rather provided conditions within which each individual art form could interact, with the goal being the creation of a third thing: something new and unpredictable. This interplay reminds me of the attention you pay to the exhibition of your work—the way that work inhabits and responds to a space (and sometimes changes itself throughout the course of an exhibition), and the way that viewers experience both the work through time. It seems the intention here is to reveal something beyond the “object.” One clear example is your exhibition at the Secession in Vienna in 2013, where procession played such an important role. Can you speak to the idea of the parcour, and how the art relies on (or is changed by) the path of movement of the viewer? LD: In almost every solo outing, I determine the placement of the walls, and in the case of Secession, the rerouted entrance to the space. The basement of Secession is usually entered from stairs or an elevator from the main gallery upstairs, and the viewer passively enters a not-so-coherent schema of three spaces. I altered the approach to these galleries by opening up a side entrance that is usually only accessible, and reserved for, the friends of Secession. By doing so, I have accomplished two important criteria for the work: conscious (and not passive engagement) and viewing through a portal now made available to everyone, and not the select few. It also made the sequence of the spaces much more logical, opening up possibilities for movement and autonomy by and for the viewer. 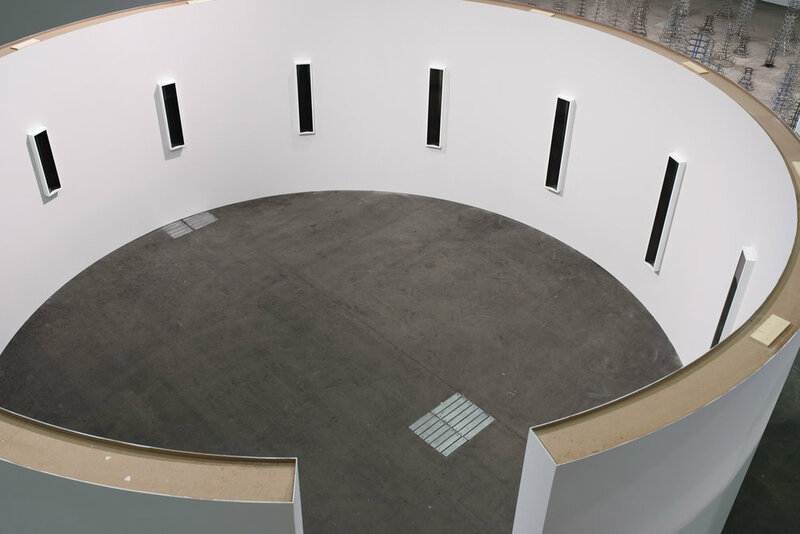 Exhibition: Liz Deschenes (December 7, 2012 - February 10, 2013). Secession, Vienna. Photos courtesy the artist and Miguel Abreau Gallery, New York. Stereograph 1-16, 2012. Exhibition: Liz Deschenes (December 7, 2012 - February 10, 2013). Secession, Vienna. Photos courtesy the artist and Miguel Abreau Gallery, New York. Green Screen #4, 2001/2016. Exhibition: Liz Deschenes, ICA Boston (June 29 - October 16, 2016). Photos courtesy the artist and Miguel Abreau Gallery, New York. Gallery 4.1.1, 2015.Exhibition: Liz Deschenes, ICA Boston (June 29 - October 16, 2016). Photos courtesy the artist and Miguel Abreau Gallery, New York. 4. CA: How work is produced (i.e., its technique or technology), has historically been an important component of all art, and indeed in some cases a defining element of an entire movement, as in (for example) the action and stain painters of the 1950s. Photography, however, was an art form impossible without leveraging more complex and generally less immediate science. As such it has been particularly defined over its relatively short history by technological advances. Today, however, with the move to digital photography, one could argue that layers of process and production have been denied, supplanted by the immediacy of speed and by an emphasis on post-production. What role do you think technology has in your work, and what can slowness reveal? LD: In thinking about this question I was reminded first of a paragraph written by Carter Mull about my work, which I think is relevant. With his permission I’ve re-presented the excerpt below. Moiré, 2009. Exhibition: Liz Deschenes, ICA Boston (June 29 - October 16, 2016). Photos courtesy the artist and Miguel Abreau Gallery, New York. Bracket #7, 2014. Green Screen #5, 2001. Exhibition: Liz Deschenes, ICA Boston (June 29 - October 16, 2016). Photos courtesy the artist and Miguel Abreau Gallery, New York. 5. CA: Many of your photograms intentionally oxidize over time. Because multiple in-person visits would ideally be needed to appreciate their mutability, a certain complexity of interpretation, and criticism, is introduced. In essence, one person’s experience of a particular work could be quite different than another’s—not just because the viewers are different, but also because the work itself is changing. Could you discuss the nature of change and your thoughts on how these works ought to be seen? What role does time play in your work, from creation through the viewing process? When do you consider a work like this to be finished? LD: Many of my concerns are spatial, material and experimental. I research the beginnings of inventions, failures, overlaps, and the shared desire to make certain discoveries come to light. The work is never really finished, as I often make plans to reconfigure work from previous installations. A recent example of this was the survey exhibition “Timelines” at ICA Boston, which I later took the same work and reconfigured, with two photographs added on, in order to complete a circle at Art Unlimited this past spring in Basel, Switzerland. Timelines, 2016. Exhibition: Liz Deschenes, ICA Boston (June 29 - October 16, 2016). Photos courtesy the artist and Miguel Abreau Gallery, New York. Timelines, 2016. Exhibition: Art Basel, 2017. Photos courtesy the artist and Miguel Abreau Gallery, New York. 6. CA: Your work has been compared to Sherrie Levine’s and Sarah Charlesworth’s in terms of using photography to question the photographic representation in our culture. Could you speak a bit about how you view your work in relation to that by the Pictures Generation artists? LD: Every generation has a debt to clear with the previous one. In my case, studying art in the 80’s, it become clear that the work of the “pictures artists,”—the not-so-correctly-named artists using photography, grouped by an exhibition many of them were not even in—what they were doing was very different, in that they were critical of accepting photography’s conventions, gender biases and proscribed roles. Their work asserted a forcefulness and intelligence that had to be reckoned with. Since coming to NY, I have taught with Sarah, exhibited with Sherrie’s work and, post her sudden and too-early death, I participated in a panel discussion about Sarah’s work and curated a solo exhibition of Sarah’s work in Paris. Tragically, she did not get to do that while she was alive. Like them, I am interested in using photography to upend traditional notions of image making. Because the “pictures generation” has been so eloquent and successful in critiquing the failures of modernism and lack of inclusion, they have opened up other possibilities, for me, and my generation of artists, to tackle a distinct set of questions. CA: Liz, thank you so much. Liz Deschenes graduated from the Rhode Island School of Design in 1988. She teaches at Bennington College and is a visiting artist at Columbia University’s School of Visual Arts and Yale University. Her work is held in the permanent collections of the Centre Pompidou, the San Francisco Museum of Modern Art, theSolomon R. Guggenheim Museum, the Whitney Museum of American Art, the Museum of Modern Art, The Metropolitan Museum of Art, the Walker Art Center, The Art Institute of Chicago, ICA/Boston, the CCS Bard Hessel Museum of Art, the Milwaukee Art Museum, the Corcoran Museum of Art, and the Hirschhorn Museum and Sculpture Garden. She was the recipient of the 2014 Rappaport Prize. Deschenes has recently presented her work in a series of two-person exhibitions with Sol LeWitt at Fraenkel Gallery, San Francisco (2017), Miguel Abreu Gallery and Paula Cooper Gallery, New York (both 2016). Her work was the subject of a 2016 survey exhibition at the ICA/Boston. In 2015, Deschenes presented solo exhibitions at MASS MoCA and the Walker Art Center, and was included in group exhibitions at the Whitney Museum of American Art, Musee d’Art Moderne, the Centre Pompidou, and Extra City Kunsthal in Antwerp. In 2014, her work was featured in Sites of Reason: A Selection of Recent Acquisitions at the Museum of Modern Art and in What Is a Photograph? (International Center for Photography, New York). In 2013, she exhibited new work in tandem solo exhibitions at Campoli Presti (Paris and London), and group exhibitions at the Museum of Modern Art and the Fotomuseum Winterthur, among others. In 2012, she was included in the Whitney Biennial and had a one-person exhibition at the Secession in Vienna and a two-person exhibition at The Art Institute of Chicago that she co-curated with Florian Pumhösl and Matthew Witkovsky. Previously, her work has also been exhibited at the CCS Bard Hessel Museum, the Aspen Art Museum, Klosterfelde (Berlin), the Walker Art Center, the Langen Foundation (Düsseldorf), the Tate Liverpool, and the Metropolitan Museum of Art.